Beauval Zoo, known simply as Beauval, takes a long time to see. A very long time. After entering you can spend an hour or more just a few steps from the entrance alone. The first thing that catches your eyes is a pink cloud. Watching the flamingos will take up your first half hour. The second will be taken up watching lemurs lolling against tree trunks, legs akimbo warming their bellies, catching the rays. Beguiling. Of course, half an hour is not nearly enough for any one animal and there are ten thousand at Beauval. Flamingos and lemurs compete for attention with the ducks, not your ordinary common or garden variety; these are exotic with the most astonishing colours. It is hard to tear yourself away until, out of the blue, comes a screech like nothing we, at least, had ever heard. Hurrying along the path to locate whatever it is demanding attention we are taken aback when a timid voice wishes us a gentle ‘bonjour’. Where did that come from? The outdoor aviary. From a pink galah. Did a bird just say ‘bonjour’ a passer-by asks? It did say we and spend another half an hour saying ‘bonjour’ back. 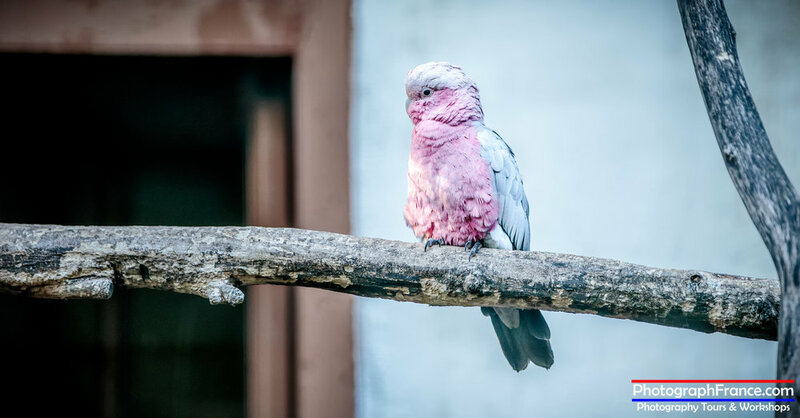 We had no idea that galahs are mimics. One was even mimicking the squawk from its next door neighbour. There it comes again. Loud enough to wake the dead. Unearthly. What could be making it? A Great Rhinoceros Hornbill that’s what. We had never seen a hornbill. It’s huge, with a five foot wingspan. Magnificent. Not to be confused with the toucan famous for the Guinness ads. Their brightly coloured beaks make you assume they are related. Not so. Hornbills live in Africa and Asia. Toucans live in Central and South America. Plus. The hornbill has a distinctive casque – a bony growth – on top of its beak (casque is French for helmet). Tearing ourselves away from this astonishing creature we enter an indoor aviary and almost weep with joy. Birds everywhere. Swooping and diving over and around us, tropical birds only the well traveled ever get to see. Outside again, a little further along the path we find ourselves at eye level with penguins cavorting underwater. Beauval is an experience in the best meaning of the word. You don’t just look at the animals you feel them. You feel their spirit. You feel part of them and they of you. The joys, the surprises, are never ending; they just go on and on. And on. If not for zoos like Beauval where could ordinary people, living ordinary lives, managing on ordinary salaries, see magnificent white tigers, koalas snoozing in the crook of a tree, Giant Pandas happily munching on bamboo shoots and Gorillas, eyes closed in harmony with the world, taking the morning sun? White tigers are not able to camouflage themselves which reduces life expectancy in the wild making it one of the most endangered species on the planet. Since they arrived at Beauval, many have been born to Gorby and Raissa and to their offspring Sherkan and Chili. The magnificent African lion with the magnificent mane – hard not to think of Aslan – snoozing on his log can barely be bothered to move as he keeps an eye on his pride from under his absurdly long lashes. Majestic. We were lucky to get up close and personal before he moved to his bigger home as near to the savannah you can get outside of wherever savannahs are. It’s vast, almost a square mile. Better for him, less so for us. He now has more places to hide. No zoo we have visited has anything as memorable as Beauval’s three thousand seater theatre built for its Masters of the Air spectacle. Hundreds of birds swoop down to barely skim your head so don’t stand up. Look at Me, Look at Me cranes, pelicans, storks, ibis, raptors, cockatoos, macaws, parakeets, eagles, vultures, condors and snowy owls demand attention. Anything you can do I can do better. Truly, truly, awesome. Moving. The joy of Beauval is that you can enjoy the animals without that nagging frisson of guilt for enjoying them. They are light years away from exploitation. No animal in the wild has a 24/7 Vet. If it is possible for animals to look content they certainly look content here.